Who remembers time capsules? A rusty coffee can filled with artifacts to document the past to future generations. Everyone’s favorite artifact: the predictions about the future. Harvard University professor and psychologist Robert Coles time capsuled American childhood during the 1950’s. His prediction: children caught in the throes of rapid change and social upheaval would begin to evolve in their growth and development patterns. Studying today’s children and youth gives us insight into the generation following closely on their heels. He (rightly) predicted the biggest shift would happen within three areas of development: intellectual intelligence, emotional intelligence, and moral intelligence. In The Moral Intelligence of Children, Coles notes that past generations aggrandized intellect and emotional intelligence while trivializing moral intelligence. Much to our chagrin, it is why we find ourselves in the moral state we are in today. Giving his life to psychological research on the growth and development of children, Coles concluded that, “…it’s our obligation to be hopeful for the future and to hand on a better world for our children.” I have to agree. segmented thanks to the rapid expansion in Cable TV channels, satellite radio, the Internet, etc. According to a comprehensive study by Futurecast and Barkely, Inc., Generation Z closely resembles the Boomers in their more traditional views of education, hard work, money, and career advancement. However, “This generation is writing new rules that favor liberal—almost radical—viewpoints on things like race, gender, identity, and sexuality. Socially and technologically empowered, they are arriving on the scene at a crucial moment in history.” To me, Millennials are another great generation because they had to grow up in a kairos moment in history where so much innovation and technology was being discovered in an age of globalization. What some people attribute as apathy, I tend to view as contemplative. As “big brothers and sisters” to Gen Z, they helped figure out an awful lot in the midst of a dynamic and dramatic era. Generation Z is now applying that contemplative thought and making it actionable. Gen Z tends to hold a traditional ethos in areas such as honesty, loyalty, and achievement. They also mimic the Boomer’s values of responsibility, determination, work ethic, dependability, money, intelligence, and independence. The world has changed and so have the rules. Robert Coles was right: increased connectedness can multiply the potential for interpersonal goodness and interconnected greatness, if we do it right. While we might not fully understand the current reality of Gen Z because we were raised in a pre 9/11, pre-ubiquitous connectedness context, innovators like David Eaton at Axis are keeping us aware of the reality of youth today. They’ve created a Cultural Translator that gives weekly insight into how pop culture, technology, and media are influencing our youth. Being highly aware of what’s going on in the world around us is biblically necessary. In Acts 17, Paul provides a model for how to engage culture. Walking the streets of Athens he “looked carefully” at the temple and the various gods he finds there, noting that the “objects of worship” (Acts 17:23) were “formed by the art and imagination” of man (Acts 17:29). He was also familiar enough with their literature to quote it in his preaching about Christ (Acts 17:28). We are noticing that, with each passing generation, the focus is increasingly turning selfward. It is critical to know how to effectively connect intergenerationally. We must help steer the cultural push for selfism to a biblical focus on Christ as the outward manifestation of something much greater than the self. To do this we must constantly rely on a thick gospel narrative that guides identity formation away from a splintered self, as evidenced by social media. 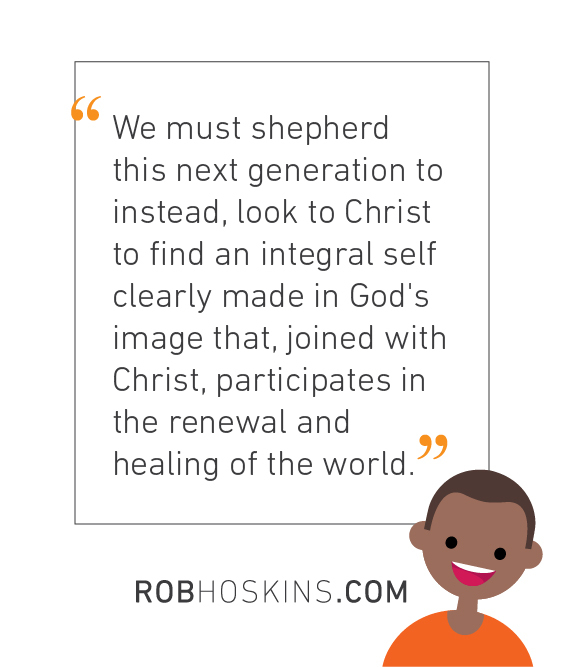 We must shepherd this next generation to instead, look to Christ to find an integral self clearly made in God’s image that, joined with Christ, participates in the renewal and healing of the world. A thick gospel narrative guides identity formation away from a splintered self.